Just an update on the cannabis file. There has been considerable interest in this topic since, well, the past few years I suppose. But after the Liberals came back to power, with Justin Trudeau making a clear argument for legalization, not just decriminalization, the attention has been ramped up. I’ve had a chance to speak to the media quite a bit on this, and several articles have come out about the topic. Why should liquor control boards sell cannabis? Of course there is more, and some of it does not take a historical focus apart from looking at the last few months or years’ experiences. These are important perspectives, but a longer view gives us more insight. After all, both the Colorado and Washington state regimes are still being established. My concern with this editorial was this fixation on “big cannabis” which rhetorically links it to other industries presented as conspiratorial and out to mess with the public’s health, such as “big tobacco” and “big pharma.” Let’s leave the rhetoric aside, since it does nothing more than perpetuate myths that may not be valid. Yet although I advocate cannabis legalization (and note, I have never smoked the stuff and have no interest in consuming it in any way) I should note that there are many voices of caution. I’m not going to post them all, but a quick jump into the newspapers will reveal a range of angles. As a caution, remember to read through the rhetoric and into the evidence. Here is a good example of rhetoric trumping content, as presented in the Toronto Star also on 22 December. Pretty alarming title, huh? And given that many people may see this on the front page in large type it could sway opinions. But read on. Yet the Star’s title, histrionic as it is, suggests something more dire. It is literally correct, but does not provide anything like the nuance that the study found. I’m not surprised (and wrote to the Star about this, a letter which appeared 4 January 2016) because the Star is historically a prohibitionist paper. That angle persists, just manifested in different ways. While we are talking about rhetoric, I’d like to point out the rhetoric of opponents. This is the problem I find, that people internalize the intense moralism of those who disagree with cannabis legalization. Like the temperance forces a century ago, they write as if the substance itself will bring down Western society. I’m totally shocked that you have allowed yourself to be brainwashed by potheads’ lies and propaganda. Pot is definitely more harmful than pot. While cigarette smoke harms only the lungs, pot smoke harms both lungs and brains (especially young brains). And cigarettes don’t cause impaired driving resulting in injuries and deaths, like pot does. And the much-ridiculed old film “Reefer Madness” has been proven to be truthful and correct after all by news and evidence. Thank you for your interesting message. I’m not sure where you’re writing from or what aspects of my recent discussion on cannabis legalization you’re responding to and choose not to engage you beyond pointing out one thing. You may wish to look beyond blogs and journalists for your evidence. I prefer getting my information from respected sources written by researchers whose jobs it is to ask critical questions and then look at the evidence available, like CAMH, or the Lancet, or the CMAJ, all of which come out in favour of legalization due to the way it will reduce associated harms. I don’t think these peer-reviewed journal article authors are “potheads” nor that their evidence can be called “propaganda.” I think they are critical scholars who also seek to figure out if a perspective is supported by evidence or not. I am also not a pothead. I don’t smoke the stuff, never have, and never will. I find people who smoke pot boring, and the smell is disgusting. I’d rather have a beer. What I didn’t point out is the fun you can have with stats. If deaths rise from 2 to 3, that is a 50% increase, but only one additional death (not that any single death should be acceptable, but again, we’re dealing with histrionics). If deaths rise from 1 to 2, that’s a 100% rise. That said, the RMHIDTA data deals with larger numbers, but the meanings behind those numbers are shaded with caveats about limits to data and the way it’s reported. this, of course, is lost on the correspondent, and also on Den Tandt, the National Post article’s author. (BTW, the RMHIDTA is a passionate anti-drug collective of policing agencies, so don’t expect their stats to be clear or unbiased. The story is always the same: dig deeper. Be critical. Always. Ask where the information is coming from, and whether it makes sense. That also applies to the information I provide here. After all, this is just another blog. 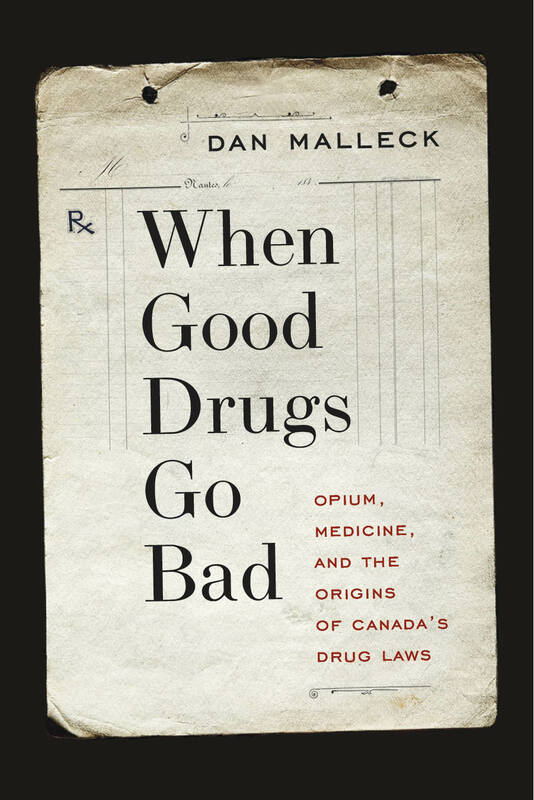 After several decades of working on this (ok, worked on it in the 90s then took some time away) my book, When Good Drugs Go Bad: Opium, Medicine, and the Origins of Canada’s Drug Laws has been released. You can order a copy of the hardcover here. And for reference, here is a picture of the cover. Below I will tell you more about it. In this book I look at the origins of Canada’s drug laws, the century or so before the creation of the Opium Act, 1908, and the Opium and Drugs Act, 1911. My main question was simple: where did the idea come from that some drugs were bad and needed to be regulated. It may seem simplistic, but beneath this question are a bunch of related issues: Why is addiction considered a problem? ; what is wrong with recreational drug use? How did the idea that government should be involved in the regulation of drugs come about? These may seem odd questions, but they really are fundamental to our understanding of current debates over drug laws and drug use. For example, we seem to have this idea that recreation is an illegitimate application of chemicals. That is, you can take drugs for pain killing, to heal, to allow children to focus, to reduce coughs, and to get rid of the sniffles, but once you enjoy them purely for the sake of enjoyment, you are misusing drugs. Here we get this idea of “drug abuse” which is linguistically connected to things like child abuse and spousal abuse, but in this way we’re really considered to be abusing ourselves by using drugs in a way other than one medically acceptable. Why was medicine the only legitimate use of such substances? How did physicians get that kind of power? Why are pharmacists the ones who should be managing the sale of drugs? The book takes a long view, stretching back to pre confederation, to look at the various uses of drugs, and the different ways that people began to suggest there are legitimate and illegitimate uses of them. It traces the creation of provincial pharmacy laws, which I argue are Canada’s first drug laws. Here the idea emerged that the trade in certain substances should be governed by small groups of educated men rather than allowing the free market to do its thing. Once you establish the idea that some things should be controlled by government pronouncement, and you deputize groups of professionals to do the controlling, that scope of control can be broadened. The idea of controlling drugs that could kill you broadens to include controlling drugs that could hurt you. Then the idea of “hurt” expands to include not just maim or debilitate, but perhaps just make you need them all the time (habituation, or addiction). It’s a complex story, and one that needed to be told for Canada. I hope you enjoy it. Buy multiple copies. Christmas is coming, after all! Smoking is considered a pariah activity. Smokers, driven by “Clean Air” laws, zealous public health advocates and self righteous non smokers do their thing on the edge of activity. Back doors, 9 metres away from doors, unsheltered, cowering, hiding, heads down, grimaced. This is how health messaging becomes moral shaming. I’m not a smoker, find the habit gross and stay away from smoke, but the overly evangelical approach of the public health advocates to shame into submission the few smokers of the world really bother me. It is this biopolitical stance, the idea that you internalize the messages of the state related to your body or health in general, that informs other aspects of health messaging and health politics in general. So it is no surprise that when the Supreme Court of Canada agreed (unanimously) that it is unconstitutional for our medical marijuana laws to render illegal all forms of marijuana except in its dried form–marijuana you normally smoke (ie: brownies, marijuana tea, etc still illegal) some people got pissed off. You see, smoked marijuana is the most reviled form. It’s kind of gross, and every picture you see on the media of people smoking pot have some unshaven pursed lips sucking from a filthy crumpled spliff. It’s right up there with those gross pictures on cigarette packets: a repellent disincentive to smoke. The Supreme Court seems to be immune to the aesthetic sensibilities embedded in public health messaging. Indeed, the justices to a person decided that this “dried only” provision unnecessarily hindered the reasonable access to a useful drug. To be clear, the ruling was about the clause that makes only dried marijuana permissible for medical marijuana, but the main way to consume dried marijuana is by smoking. And smoking itself, along with its aesthetics, is perpetually connected to the idea of carcinogens or other toxic elements in the product being smoked. So it is an easy leap from something being smoked to believing with little evidence that that item causes cancer. The Tories are not happy. Health Minister Rona Ambrose is “outraged.” Of course she is. Their mission with respect to drugs has been to return marijuana to its illegal status, so a ruling that makes it more accessible is outrageous in their eyes. Don’t be swayed by her arguments that her outrage comes from perspective that only Health Canada can decide if something is acceptable as a medicine. The court is not changing the medicine; only the mode of ingestion. Indeed, it’s about access. But, I get it. The concern is that marijuana is a gateway drug, and that restricting medical marijuana to its smoked form makes it a narrow and rather unappealing gateway. Well, not to be concerned. The legalization of marijuana has shown that the gateway theory is bunk. So there’s no gate to make ugly. Today is good news for those of us who think the drug laws are overly restrictive and not very useful. And the fact that it’s another decision that shows the Tories are out of step with the basic elements of our constitution is just icing on the space cake. Two more states voted for various forms of cannabis legalization. The District of Columbia also voted to permit marijuana possession. Several municipalities in New England passed similar initiatives. These are big deals. How they will play out in Canada (if at all) is a good topic of debate. I spoke to Yahoo News about this, and they published an article reflecting on the potential impact. As noted in the article, I think that the most interesting part of these outcomes is in Oregon, where the existing Liquor Commission will take on the role of regulation. (In Alaska a similar situation would be temporary, with a Marijuana Control Board possibly taking over). Since we have liquor commissions or liquor boards in all provinces, it makes for a good template for a legalization framework. I should note, with due diligence, that I mis-remembered the Washington State law. It also puts the regulation of cannabis in the hands of the state liquor control board. Don’t ask me how I misremembered it, ok? These things happen on busy days when you’re asked to respond quickly. There is a lot of attention to the issue of legalization of marijuana. So I wrote a little op-ed. It was published today. I have to say the editors came up with a much better title than I had given it. It was so forgettable, I forget my title. How to legalize pot? We figured this one out a century ago. Before I begin, a little Shakespeare tutorial. When Juliet says “Wherefore art thou Romeo?” she’s not asking “where are you?” but “why are you?” In other words, “why are you a Montague?” Her concern was, of course, that he was the child of her family’s arch enemies. I say that because I’m being snooty humanities guy, and using clever word structures to suggest a depth of understanding. It may be a ruse to seem deep. Although I do think I stopped trying sometime in second year undergrad, since, contrary to the messages of 1980s high school films, depth was not getting me a girlfriend. Ok, that’s way more information than I intended to give here. Let’s move on. The question of the day is: what use is medical history. I was talking about this recently with some colleagues who were asking me what value can medical history provide to health professions. I was a little preoccupied at the time, and gave a rushed answer. The even more rushed answer is “plenty.” But time did not permit me to get into it in more depth. There has been a big push for medical humanities to be added to medical training recently. The Canadian Medical Association Journal (CMAJ) had an article a few years ago asking why Canadian med schools lag behind the US in this innovation. The CMJ (which sounds deceptively like the CMAJ but is actually the Croatian Medical Journal) had a great issue on the implementation of medical humanities, mostly focused on initiatives in Eastern Europe. Indeed, there is actually a Journal of Medical Humanities, too. The evidence generally points to the development of what are often (inappropriately, to me) called “soft skills”: interpersonal interaction, sensitivity to patient needs, awareness of the broader social and cultural issues affecting a patient, etc. This all goes under the “quality of care” or “professional acumen” or “professional competencies” label. It’s important, affects patients directly, and is certainly not “soft” in its outcome. I did not talk about that stuff. I had read a lot of that material, and could have gone on at length, but I wanted to talk about something else, something closer to my research and experience. Medical history, as medical historian and hematologist Jacalyn Duffin has noted, has the potential to teach health practitioners the value of life-long learning and healthy skepticism. That is, history shows us that we exist on a continuum between the past and future, and that all of our knowledge, techniques, innovations, and assumptions about health are driven by our social and cultural values, economics, politics, and processes that have gone before. Rather than see what we do as “true” and what people did in the past as “wrong,” rather than looking at the past and saying “how could they have been so stupid?”, medical history encourages us to see that what we believe is a product of our current reality, and that this may change. No, this will change. The example I often provide to students is the double-blind, placebo-controlled trial (DBPCT). This is considered the “gold standard” of health research. Basically, it emerged from pharmaceutical assays. You get a bunch of people. Give half of them a new drug, and half of them a sugar pill. That is the “placebo control.” But it gets better. You make sure the people who are administering the drug, and the people receiving the drug, do not know whether they’re giving/getting the real pharmaceutical or the placebo. that is the double blinded. The results are considered to be air tight proof of a substance’s effectiveness. This seems perfectly reasonable, and is to us. as long as you believe the assumptions behind this process. Assumption 1: All bodies function basically the same. This is the foundation upon which modern “western” medicine is based. It underpins the way medicine operates. If all bodies were not essentially the same, we would need to find unique treatments for each person. That is time-consuming, and undermines a particular way of doing science. It introduces subjectivity into a system that strives for evidence-based objectivity. It is also both a relatively new idea (since subjective interpretation of individual patient conditions was a hallmark of medicine until the early nineteenth century) and also based upon seventeenth century mechanistic physics that has been mostly overturned by modern quantum and string theory physics. The problem with this assumption is that it is pretty easy to contradict. The very existence of the idea of a placebo, some kind of unexplainable effect that means sometimes people who think they’re getting a drug actually get better even if they’re not getting the drug, undermines the “all bodies work the same” assumption. All bodies do not work the same. Assumption 2. Sickness is standardized. Along with all bodies function the same, there is this assumption that all bodies get sick the same way. You can see the falseness of this assumption when you ask a group of friends what makes them feel better when they have a cold. Some feel better in warm rooms, some in open air, some in the morning, some at night. If one illness entity, “the common cold” has so many different manifestations (and we’re talking almost all the time in almost all cases) then how can we conclude that a) all bodies are the same and b) all illness manifests itself the same way. So medical history helps us to explore these ideas. It shows us how our assumptions are rooted in our culture, just as the explanation about blood letting or leeching or using mercury to treat syphilis was also rooted in a complex physiological understanding of the place of the body in society. BTW, recent research has shown that mercury does have some effect on the syphilis bacillus, further suggesting that they weren’t idiots. But also suggesting that we need recent research done properly through condoned scientific methods to convince us of this fact. Moreover, medical history does give perspective. It permits physicians to understand their social role along with their medical role. A number of important books underscore this, none less impressive than Susan Sontag’s Illness as Metaphor. A critical literary scholar, Sontag was diagnosed with cancer in the early 1970s. She was surprised and offended by the way physicians and the general public layered metaphors on cancer patients, and argued that the metaphorical construction of cancer as an embarrassing illness that was probably the fault of the individual, caused way more damage and impediment to treatment than just the straight facts. She compared the metaphors of cancer to the very different metaphors of consumption/phthysis/tuberculosis/TB of the past. It’s a great read, and a detailed humanist view of medical history informing today. Well, informing the 1970s. Ten years later she published AIDS and its Metaphors and explored the topic in more detail, and from a less angry perspective. It was no less influential. I teach using such texts, and it allows health science students to understand the cultural forms we place on top of biological processes. As an historian, it is tremendously satisfying to see lights go on when students begin to understand how our ideas are a reflection of a moment in time. The other thing I like to note is how the stuff I study specifically can inform medical practice. Here is that argument. People often look to health practitioners, especially physicians, as “experts in life.” That is, we look to them for a range of answers far beyond the biological and physiological function or dysfunction of our bodies. Health policy, public health intervention, broader issues of population health, these are the sorts of things that policy makers, media, and everyday people look to physicians (and increasingly nurses and pharmacists, but still usually physicians) to help to address. Understanding policy, its formation, the politics and economics that underpinned the change, is important. If we look at a current issue of allowing pharmacists and nurses and nurse practitioners to prescribe controled drugs, we can see the way the idea of drugs as bad came about, and how it was as much a political as a biomedical issue. Indeed, as I’ve argued elsewhere on this blog, it was mostly political and economic. This understanding can help us question the assumptions behind both resistance to the change, and the advocacy for the change. Terms like of “danger” “poison” “control” “knowledge” “experience” and “authority” abound. So wherefore medical history? Because it helps to excavate the foundation of our current knowledge, gives context to what health practitioners do, and can answer many questions about today that some may not even think to ask.